Ultrasmall Radio Frequency and Micro-wave Microelectromechanical systems (RF MEMs), such as switches, varactors, and phase shifters, exhibit nearly zero power consumption or loss. For this reason, they are being developed intensively by corporations worldwide for use in telecommunications equipment. 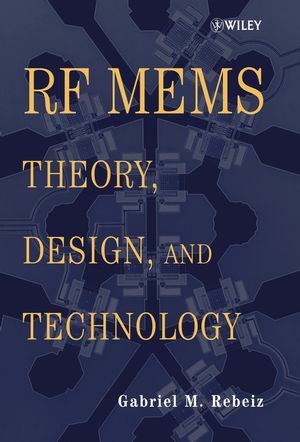 This book acquaints readers with the basics of RF MEMs and describes how to design practical circuits and devices with them. The author, an acknowledged expert in the field, presents a range of real-world applications and shares many valuable tricks of the trade. GABRIEL M. REBEIZ received his PhD from the California Institute of Technology. He was the recipient of the National Science Foundation Presidential Young Investigator Award, and in 2000 was the corecipient of the IEEE Microwave Prize. A Fellow of the IEEE and a consultant to Rockwell, Samsung, Intel, Standard MEMS, and Agilent, he has published extensively in the field of microwave technology and in the area of RF MEMS. He was at the University of Michigan, Ann Arbor, and is now a Professor of Electrical and Computer Engineering at the University of California, San Diego. Chapter 1- Introduction: RF MEMS for Microwave Applications. Chapter 2- Mechanical Modeling of MEMS Devices: Static Analysis. Chapter 3- Mechanical Modeling of MEMS Devices: Dynamic Analysis. Chapter 4- Electromagnetic Modeling of MEMS Switches. Chapter 5- MEMS Switch Library. Chapter 6-MEMS Switch Fabrication and Packaging. Chapter 7-MEMS Switch Reliability and Power Handling. Chapter 8- Design of MEMS Switch Circuits. Chapter 10- Distributed MEMS Phase Shifters and Switches. Chapter 11- MEMS Varactors and Tunable Oscillators. Chapter 12- Micro machined Inductors. Chapter 13- Reconfigurable MEMS Networks, Filters, Antennas, and Subsystem. Chapter 14- Phase Noise Analysis of MEMS Circuits, Phase Shifters, and Oscillators. Chapter 15- Future Work in RF MEMS. Appendix A: Detailed Analysis and Measurements of Intermodulation Distortion and Power Handling in RF MEMS Switches, Varactors, and Tunable Filters. Appendix B: Mechanical, Electrical, and Thermal Properties of RF MEMS Materials.